Are you ready for some football? We are! Of course, we aren’t taking sides, but you can! By working with clients on seasonal activities, especially sports-related exercises, you can spark conversation and engagement. Below are four exercises that engage a clients’ language and cognitive skills. Tackle writing: Use a whiteboard or a pen and paper to create fill in the blank sentences or phrases about the Super Bowl. For example, “If I could play football for one team, I would play for…” Other great questions include: What position would you play for the team? What number would you want on your jersey? Make a game plan: Talk to your clients about some of the best football games they’ve ever attended or watched. Ask questions about the details of the game, like where it was held, what teams played each other, what the mascots for each team were, who your client cheered to victory, etc. Recalling past events and writing a narrative about these games can target memory skills. Watch a famous play: Find clips of famous football plays on YouTube and listen to sportscaster’s review of the game plans. Talk about the game plans with your clients. Keep practicing: The key to success is practice, practice, practice. Help your clients continue making progress with TalkPath Therapy. When you create a free account, you can practice sports-related activities with our memory exercises including Sentence Detail, Paragraph Detail, and Picture Recall. 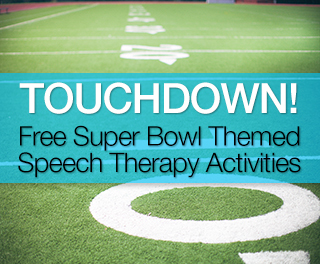 Enjoy the Super Bowl and these speech therapy ideas with your clients. Share your favorite ideas with us on Twitter @Lingraphica or comment below.